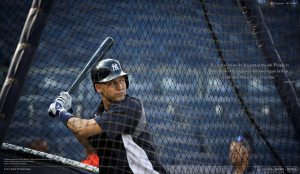 New York Yankees captain Derek Jeter retired this September and although there was a plethora of coverage focused on his career and future, the New York Times addressed one question–How many times has Derek Jeter swung a bat in his professional career?–with a novel approach to visualization. Multiplying mini-Jeter gifs are used to symbolize his swinging information until they’re barely noticeable, culminating to his career total of about 342,000 swings. This entry was posted on Tuesday, October 7th, 2014 at 11:16 am and is filed under DATA VISUALIZATION, INFOGRAPHICS, MULTIMEDIA EXAMPLES. You can follow any responses to this entry through the RSS 2.0 feed. Both comments and pings are currently closed.